Venture North is a multi-award winning, family owned company specialising in small group cultural and nature based tours throughout Northern Australia. 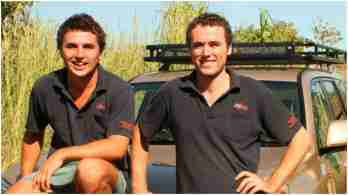 Travel the outback in luxury 4WD’s on tours from Darwin that are educational, enlightening and good fun. Experience remote Arnhem Land safaris, Kakadu tours, Kimberley expeditions and much more! More that just a Kadadu tour - see Arnhem Land and the Cobourg Peninsula on our no.1 tour. Highlights include: Wetland cruise, Maguk (Barramundi Gorge), Ubirr, Mamukala Wetlands, Nawalandja Lookout, Indigenous guided rock-art tour of Injalak Hill, Cobourg Marine Park, Victoria Settlement, Cobourg Coastal Camp and more! See more than just the highlights on a Venture North Kakadu tour! World heritage listed for both it's natural and cultural values Kakadu National Park offers so much, especially if you know where to look...Venture North offers both scheduled small group tours and tailor-made private charters all year round. Journey off the beaten track and straight into Arnhem Land (from Kakadu) on this very unique tour. Highlights include: visiting Gunbalanya Indigenous community, Indigenous guided rock-art tour of Injalak Hill, Injalak Arts and Craft Centre, Cobourg Marine Park, Victoria Settlement ruins, Cobourg Coastal Camp accommodation and more! Located on the northern-most part of Western Australia and spanning over 400,000 square kilometers the Kimberley is one of Australia's most rugged regions and an exciting place to tour. It is an immense and complex landscape that is made up of spectacular gorges, waterfalls, cave systems, pockets of lush rainforest and a large variety of unique wildlife. Start your Kimberley tour today! Heralded as one of the best fishing destinations in Australia, the remote Cobourg Peninsula is only an hour’s flight from Darwin. Cobourg Fishing Safaris (operated by Venture North) offer fly in/fly out fishing charters based from Cobourg Coastal Camp. Catering for just two fishing groups at a time they offer a very exclusive fishing experience. This is a very special trip and truly a once-in-a-lifetime experience. See the world’s oldest living culture firsthand as we take you on a journey into the remote East Arnhem Land spending time at various Aboriginal homelands and communities en route to Nhulunbuy. I am very impressed with the guides, the connection with and respect for, the Aboriginal traditional owners...The itinerary mix of freshwater pools, coastal environment and rock art was varied and engaging. Contact with Aboriginal traditional owners is something that most of us never have and the experience will stay with me for a long time. It gives us a sense of the timeless connection that they have with the land and the environment. Enjoyed the whole tour. Hugh and Ryan were very good guides and friends on the trip. Their consideration for the group and for individuals were really noted by all of us. The food was great. The cultural aspects of the trip were terrific.